At RHRLI, we’re interested in all types of hair loss and we also offer the best permanent solution you can find for hair loss or thinning hair, it’s called the ARTAS® system and it uses robotic technology to transplant healthy hair where it’s needed. We want our patients to be educated about all types of hair loss. While we normally wouldn’t recommend a hair transplant for minors, underage patients should not receive the procedure without the permission of a parent or guardian. But as hair loss experts, RHRLI wants to give you important information about children and hair loss. 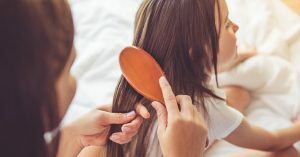 Tinea capitis: More commonly known as ringworm of the scalp, it is a fungal infection that often strikes children causing patches of hair loss. Hair often breaks off at the surface of the skin and leaves the appearance of little black dots. It can be treated with anti-fungal medications and shampoos. Alopecia areata: This is a condition believed to be caused by the body’s immune system attacking hair follicles. It also strikes adults and the process leaves round or oval hair patches. There is no cure, but most patients grow their hair back within a year, although they may lose it again. About 5 percent of patients lose hair permanently. Trichotillomania: This is a type of hair loss that’s caused by children pulling or plucking their hair out. It can be triggered by stress or anxiety and counseling can help control this condition. Nutritional Deficiency: Sometimes a loss of nutrients such as biotin, B complex vitamins or zinc can cause hair loss. Endocrine issues: Conditions such as hypothyroidism, which is an under-active thyroid, can cause hair loss. The condition can by helped by medication to replace deficient hormones. Finally, treatment for diseases such as cancer can cause hair loss. According to AHLA, hair loss usually occurs a few weeks after the first couple of chemotherapy treatments. Children often wear wigs when this happens. It’s advised to get a prescription for wigs because insurance might pay for it. The wig will likely need styling before being ready to wear. It’s also a good idea to alert your child’s teacher that he or she will be losing hair. At RHRLI, we know hair loss can be traumatic for anyone, particularly children, but we also know that most conditions that cause hair loss for kids go away after a while and are treatable. For victims of permanent hair loss, RHRLI is the only hair loss treatment center on Long Island that has the ARTAS® system. See the difference ARTAS® makes and contact RHRLI today.